It was Friday morning at the general assembly of the United Nations in New York. Pope Benedict stepped onto the podium to address the delegates from the world’s nations about human rights. 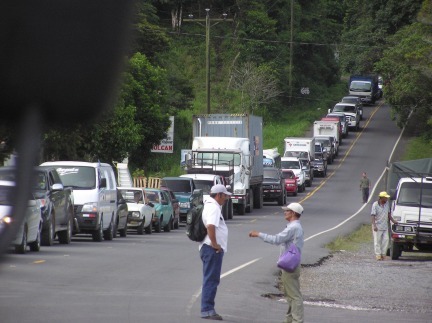 At the same moment in the highlands of Panama a group of concerned parents and school children decided to mount a road blockade in an effort to gain their human rights. The students chose a strategic location – a small bridge at the entrance to Volcan. Here they placed four large truck tires and covered them with branches from a tree. I was 9:00 a.m. And within minutes the traffic in both directions halted. Standing atop the tires and branches were about a dozen young schoolchildren. Ten minutes later the police arrived and approached the waiting students. The young women bravely stood their ground and politely told the officers the reason for the protest. I talked to one of the parents, Olinka Rodriguez, and asked what was the protest about? 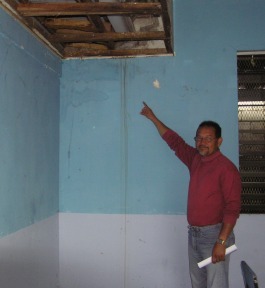 She said there were major problems at the Volcan secondary college because of a build up of toxic rat and bird feces in the space above the drop ceilings. Her own daughter she said had developed a fever and had passed out twice. Calls to the ministry of education had produced nothing, so they felt obliged to take action to save the health of not only the students but of the teachers. Another parent quickly jumped in and said that one of the teachers became pregnant during the school break. She was fine until she returned to the school and subsequently developed Tuberculosis. The traffic started to back up and soon the line of waiting cars and trucks stretched back more than two miles. Two young female students went from vehicle to vehicle handing out information sheets and tried to explain why they felt is necessary to cause this disruption. Most of the drivers I saw accepted the situation, although the looks of frustration were obvious on their faces. A similar roadblock, some months earlier by students and parents of the Nueva California school, had resulted in a four-hour blockade. That was resolved only after the parents and teachers had gained a signed commitment from the authorities the dangerous structural state of their school be repaired. 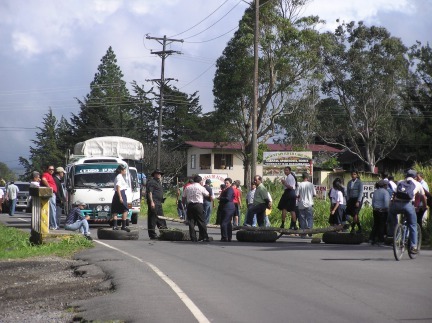 The students of Volcan secondary college, stood their ground despite appeals from some motorists to open the barricade. Just north of the blockade we heard the sound of the ambulance heading down the road. There was no question that this emergency vehicle, lights flashing, would be allowed to pass safely through. The police parked their truck a hundred yards away and quietly watched the scene. Their job it appeared was to make sure frustration didn’t erupt into violence. I went to see the school and see what was causing the many reported incidents of sickness among the students and teachers. 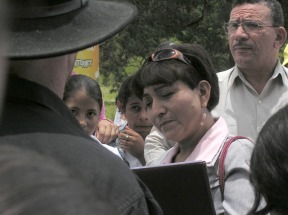 Nelson Espinoza is a parent of a 15-year old daughter, that attends the school. He gave me a brief tour of some of the classrooms. In one room he described how there was 5 inches of rat feces piled above the ceilings. The ceilings had been torn down to wipe out the problem but the stench of rat droppings still filled the air. Outside in the playground, Nelson showed me where rainwater was backing up and causing flooding. This he said was because of the inadequate size of the drainage pipe. Back at the blockade an official from the Ministry of Education arrived. She listened carefully as the parents and students outlined their case. The atmosphere was tense but controlled. The official agreed to come to the school and see the problems firsthand. This satisfied both students and teachers and shortly before 12:30 the blockade was removed. Within fifteen minutes the road was cleared of waiting traffic. Having seen student protests in North America, the scene in Volcan was remarkably different. In Volcan the truck tires were never set aflame, so there was no damage to the asphalt. No rocks were thrown at the police and although tempers did rise occasionally, no verbal insults or foul language was used by anybody. In New York the Pope had left the United Nations building, his speech on human rights delivered. 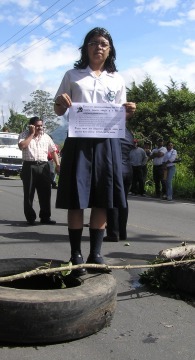 In sunny Volcan, the students, parents and teachers walked back home. The following morning a delegation from the ministry of education came to the school and promised the following: To clean all the classrooms. To replace all the ceilings. Build fourteen new classrooms. Construct a computer lab with Internet connection This was after all democracy Panama style – where protests can be powerful, peaceful and persuasive.